That was on my to-do list, but it fell through the cracks. I’ll put it in an update. This isn’t playable for me. I have a Dvorak keyboard and it’s not possible either to rebind the WASD keys or to switch Unity back to QWERTY (even though the browser itself is on it). I’m also finding that my cursor isn’t being captured by the plugin, so I can’t look around very easily. You should be able to use arrow keys as well; I’ll add a note to that effect and add ,AOE as an undocumented option in the next update. Is it possible to ‘win’ the game? There is one ending. Afterward, you will return to the title screen. Okay, so, I can’t use Unity in linux? Do you know a way around this? I’m afraid not. Unity only supports Windows and Mac for its web versions. Breathtaking. You know that why-can’t-I-make-things-like-this feel? Well, it gives me that. I love (really, LOVE) 2D, but 3D adds so much to some things. It sort of traps you in the worlds it shows, and for some reason first person 3D just makes me feel so desperate, even if it’s not tying to be. Just to clarify, I know the free version of Unity is cool, but what version did you use to make this? This was made with the free version. If it looks especially good, it’s thanks to the very nice baked lightmapping feature that gives really complex static shadows cheaply. How long do you think it would take a novice programmer with no experience of 3D software to grasp and use it usefully? It would definitely take a little while. Producing models for a game still requires use of modeling software like Blender, Maya, or 3D Studio Max. Otherwise, you’re stuck with basic geometric shapes (cubes, spheres, terrain) or free models you can find online. 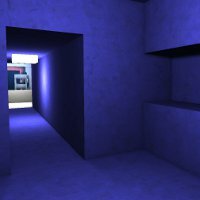 There are “prefabs” included that give you the basics of simple games (a first-person controller, some scripts for easy wiring-up of behaviors), but some scripting is required to customize anything more than that. Depending on how novice the programmer is, it might be a bit daunting. I’d recommend that a developer who’s unsure of their skills should check out Alec Holowka’s Unity Video Tutorials. They should give a good feel for the sort of skills involved, and should provide a guideline for the amount of experience required.